The first methamphetamine seizure in Afghanistan was recorded in 2008, a minor capture of four grams in Helmand province. Now, seven years later, some 17 kilograms of methamphetamine, popularly known as ‘crystal meth’, were seized in the first ten months of 2015, in 14 out of Afghanistan’s 34 provinces. The Ministry of Counter Narcotics warned about the growing number of methamphetamine users, while the Counter Narcotics Police of Afghanistan called for amendments to the current narcotics control legislation to address the low penalties for trafficking. 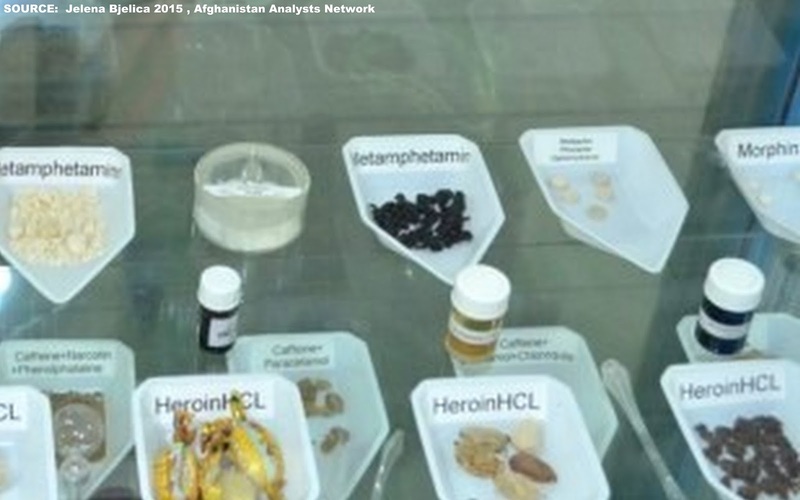 AAN’s Jelena Bjelica visited the only forensics drugs laboratory in Afghanistan and sought to learn about this new drug phenomenon in the country. Situated in a northern neighbourhood of Kabul, state-of-the-art forensics drugs laboratory of the Counter Narcotics Police of Afghanistan (CNPA) is an unlikely setting in a war-torn country. Its six high-tech labs are equipped according to the latest international standards, including a sophisticated instrument that can determine the molecular structure of sampled drugs. (1) The head of the lab, Dr Khalid Nabizada, proudly showed AAN the new German-funded building and equipment and explained that, together with his five-man team, he used to work out of a container-turned-lab in the well-guarded CNPA compound before they moved into the new building in May 2014. The lab also features a prominent display cabinet of drug samples that have been examined by Nabizada’s team. It showed drugs one would expect to find in Afghanistan: opium, hashish, morphine and heroin. But there were also several samples of methamphetamine and other synthetic drugs, like ecstasy and MDMA (methylenedioxyphenethylamine). These synthetic drugs are central nervous system, amphetamine-type stimulants (ATS), recreationally used for their euphoria-like (‘rush’ and ‘high’) effects. (2) They have recently entered the Afghan market and seem to be spreading around the country. According to Dr Nabizada, the number of methamphetamine samples analysed in the CNPA lab had clearly increased, indicating an increasing prevalence of the drug. Where in 2011 the CNPA received only samples of 16 cases, in 2012 samples of 99 cases tested positive for methamphetamine. In 2013, the number remained relatively steady, with 93 cases, in 2014 this increased to 146 cases, to finally reach 206 cases in the first ten months of 2015. This also tracks with an increase in methamphetamine seizures. Since the 2008 seizure of four grams in Helmand, the amount of seized methamphetamine has significantly increased. Drugs seized by CNPA mobile detection teams are sent to Nabizada’s lab for weighing. In the glass-walled weighing room (which is according to the highest international standards, as it allows the arrested person to witness the procedure while sitting in the room next door), Nabizada and his team carefully weigh each seizure, taking samples from each batch, before they store it in the adjacent well-guarded drugs evidence room. The amounts weighed by Nabizada’s team have been on the increase: from 2.6 kilograms in 2012, 4.9 kilograms in 2013, 4.1 kilograms in 2014, to a record high of 17 kilograms in the first ten months of 2015. According to the Ministry of Counter Narcotics (MCN) 2012 Afghanistan Drug Report, the CNPA lab received methamphetamine seizures from six provinces in 2012: Herat, Farah, Faryab, Kandahar, Balkh and Kabul. The largest seizure was from Faryab province, 530 grams of methamphetamine; the second-largest seizure, in Kandahar, was 240 grams. In 2015, the spread of seizures also increased: the 17 kilograms of crystal meth was seized in 14 out of Afghanistan’s 34 provinces (Badghis, Baghlan, Balkh, Farah, Faryab, Ghazni, Helmand, Herat, Kabul, Kandahar, Kapisa, Kunduz, Nimroz and Parwan). Local or regional chemistry skills? 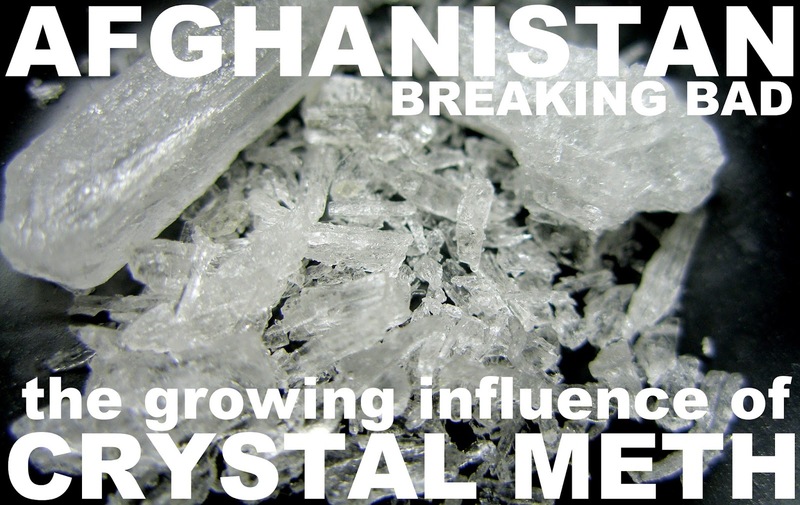 The seizures show that in Afghanistan two types of methamphetamine are in use, crystal (in Dari called shisha, which means “glass pane”) and tablets. The tablets were mainly captured in Kabul and Kunduz and probably originate from Central Asia, which is an emerging ATS market, according to the CNPA lab experts. By far, most of the meth, or shisha, is seized in the western Afghan provinces. Between March 2009 and March 2013, according to the Afghanistan Drug Report, around 92 per cent of methamphetamine samples analysed by the CNPA forensics laboratory were seized in western Afghanistan, namely in Herat, Farah and Nimroz province, all close to the Iranian border. The lead character of the US crime television series Breaking Bad explained the secret of making crystal meth as “basic chemistry.” According to a CNPA lab expert, seven to eight recipes exist for cooking crystal meth. The easiest, and cheapest, is done with ephedrine (or cough syrup), iodine and red phosphorous. “If you have ephedrine, it costs almost nothing,” he said. The 1971 UN Convention on Psychotropic Substances was the first global attempt to prevent misuse of central nervous system stimulants and to limit their use for medical and scientific purposes. Despite these attempts to control it, crystal meth emerged as a new and commonly abused drug on the bourgeoning rave scene in the USA, Europe and East Asia in the 1990s, mainly due to its ability to elevate the mood and increase alertness, concentration and energy. Many countries, as a result, sharpened their penalties for crystal meth possession, supply and production, in some cases awarding up to life imprisonment for the latter offence. However, in Afghanistan penalties for possessing and selling crystal meth are rather light. The current Law against Intoxicating Drinks and Drugs and their Control (see the law in Dari here and an unofficial UNODC English translation here) has penalty provisions for amphetamine type stimulants that are the same as those for cannabis. (4) Additionally, the threshold for considering the trafficking of methamphetamine to be a major crime, and thus to be processed by the Criminal Justice Task Force (CJTF), is the possession of 50 kilograms or more, the same as for cannabis. To date, the CJTF has dealt only with one methamphetamine case. The case concerned a person caught in Kabul in April 2013 with 3.5 kilograms of pure crystal meth, which, strictly speaking, was way below the legal threshold. But it was also the single largest crystal meth seizure ever in Afghanistan and, by international standards, an unusually high amount. The person was sentenced to 15 to 20 years imprisonment, according to the Special Bulletin of the Supreme Court. The CNPA has been leading an effort to amend the legislation to include much harsher penalties for the trafficking of methamphetamine. The proposal includes a penalty of up to 10 years in prison for the trafficking of more than 100 grams of methamphetamine, and six to nine months, plus a fine, for the trafficking of up to five grams. The Ministry of Counter Narcotics also warned, in its 2012 Afghanistan Drug Report, that the sentencing provisions for methamphetamine trafficking were “inadequate to address the seriousness of the crime” and suggested revising the law in line with international conventions and sentencing guidelines so that it would be “in line with the threat posed by the substance.” However, at this point it is unknown when the parliament will discuss the proposed amendments to the law. To date, street use of crystal meth has only been reported from Herat, Dr Stanikzai says. In other urban centres, although available, crystal meth is not used in public. The price of 20 US dollars for a dose, in contrast to 1.5 US dollars for a dose of heroin, suggests that crystal meth use is mainly reserved for the rich strata of the population and, therefore, unlikely to be widely used in public. An additional problem is that, when asked, users usually say they have a problem with “crystal” – using a Farsi slang word for the drug – rather than “methamphetamine.” However, a type of high purity heroin is also called “crystal” among drug users. “This adds a degree of confusion to the registration, as treatment centres do not have the means to test for the presence of methamphetamine and cannot be certain of the substance the patient used,” noted the 2013 Afghanistan Drug Report. The growing number of crystal meth seizures and the indications of an increase in use in Afghanistan are worrying, given the country’s already heavy dependence on the opium economy. Afghanistan continues to be the world’s leading opium producer and cultivator (see AAN reporting on 2015 opium cultivation). With the already high prevalence of opioid use – estimated between 1.3 and 1.6 million Afghans (see 2015 National Drug Use Survey available here) – the country does not need a new drug on the market. Crystal meth prevalence is still dwarfed by Afghanistan’s opiate production and consumption, and it may never find its way into all pores of the society in the way that the opium economy has. Nevertheless, the production and trafficking of meth could add another complicating layer to Afghanistan’s already complex narco-economy. So far there is no strong evidence to suggest that crystal meth is entirely indigenously manufactured, but this may change. Heroin is currently locally produced, whereas ten years ago it was not. If an increasing number of meth labs were to be detected in Afghanistan, this would be an alarming signal. Afghanistan could for instance follow the example of Myanmar, once a leading opium cultivator and heroin producer, which replaced labour intensive opium cultivation with synthetic drug production. Together with Thailand and China, Myanmar is now a leading producer of synthetic drugs in South East Asia. Such a scenario for Afghanistan would involve a transformation of the nature of the country’s drug economy, resulting in changes in local drug networks and possibly even a ‘generation shift’ within it (in Myanmar, for instance, the new generation of drug lords only embraced synthetic drug production after opium cultivation was successfully phased out). But it is also quite possible that meth trade and production simply will add to the already considerable list of illicit sources of income. It is yet unclear who is likely to benefit. (1) The laboratory is equipped with the latest analytical instrumentation including Gas Chromatography–Mass Spectrometry (GC–MS), High Performance Liquid Chromatography (HPLC), Raman Spectroscopy, and Fourier Transform–Infra Red Spectrophotometry (FT–IR) – and may be more sophisticated than many forensic drug labs in Europe. Details about the lab can be found on the page 88 of the 2013 Afghanistan Drug Report. (2) Amphetamine-type stimulants (ATS) are a group of substances comprised of synthetic central nervous system stimulants, including amphetamine, methamphetamine, methcathinone, and ecstasy-type substances (eg MDMA and its analogues). Internationally, the production, distribution, sale and possession of methamphetamine is restricted or banned in most countries. Methamphetamines and amphetamines were discovered in the late nineteenth century and are used for the treatment of attention deficit hyperactivity disorder (ADHD), obesity and narcolepsy. During the Second World War they were used by both the Allied and Axis forces to keep pilots awake during night raids. In the 1950s, amphetamine became known as a weight-loss drug and in the 1970s was widely used as a recreational drug. The latest available UNODC estimate suggested that the retail value of the global illicit methamphetamine market in 2008 was around 28 billion US dollars. (3) “The evidence from the dismantled labs suggests there were attempts to make crystal meth in Afghanistan – in particular the traces of red phosphorous found in the labs, which is usually used for cooking the meth. There is also anecdotal evidence that Iranians trained Afghans in meth production, although this has not been confirmed,” a CNPA lab expert told AAN, on the condition of anonymity. (4) Article 47: Punishment for Trafficking of Substances or any Mixture Containing Substances listed in the Tables of this law, prescribes the following sentences for: More than 250 grams up to 500 grams, imprisonment for more than one month up to three months; More than 500 grams up to 1 kilogram, imprisonment for more than three months up to 1 year; More than 1 kilogram up to 5 kilograms, imprisonment for more than one year up to three years; More than 5 kilograms, in addition to three years imprisonment, for each additional 500 grams imprisonment for three months. (5) As reported in the 2013 Afghanistan Drug Report, according to the Ministry of Public Health records the highest number of methamphetamine users in 2012 in Nimroz, Kunduz, Jawzjan and Farah provinces. The four provinces together made for 96 percent of all registered methamphetamine users countrywide. Jelena Bjelica is an independent researcher and a former journalist. She is also a practitioner in development, including with UNDP in Kosovo 2009 to 2010 and with UNODC in Afghanistan 2010 to 2014. Her recent academic and other publications include: Networks of Regressive Globalization and Challenges to International Assistance Report: Case Study Afghanistan, Bojicic-Dzelilovic V. and Kostovicova D. (eds), London School of Economics and Political Science (2012); Human Trafficking and National Security in Serbia, in Migrations and Media, Moore, K., Gross, B. Threadgold, T. (eds. ), Peter Lang Publishing Group (2012); Briefing Paper on 2009 Annual Programme for Kosovo (under UNSCR 1244/99) under the Instrument of Pre-Accession in the context of the 2009 ‘enlargement package; European Parliament, Brussels (2010).